Bill Bryson said, according to my sister anyway, that if a Martian were to land on Earth, it would assume that Vienna was the capital of the world. Going by the number and density of grand and very impressive buildings, he's certainly right. The architecture in Vienna is amazing, as are the numerous museums and the Viennese cafes.... and the delicious cakes they serve. One could spend weeks there and not take in everything there is to see. And we couldn't be so close and not take a train out for another glimpse of the beautiful Wachau wine region! We had a great few days in Vienna and it was fantastic to meet up with family, for us and for Luca. It made us miss family and home life a bit though...... we're three months on the road this week and it's starting to feel like an eternity since we left. Perhaps it's more a permanent base that we're missing, as opposed to home. 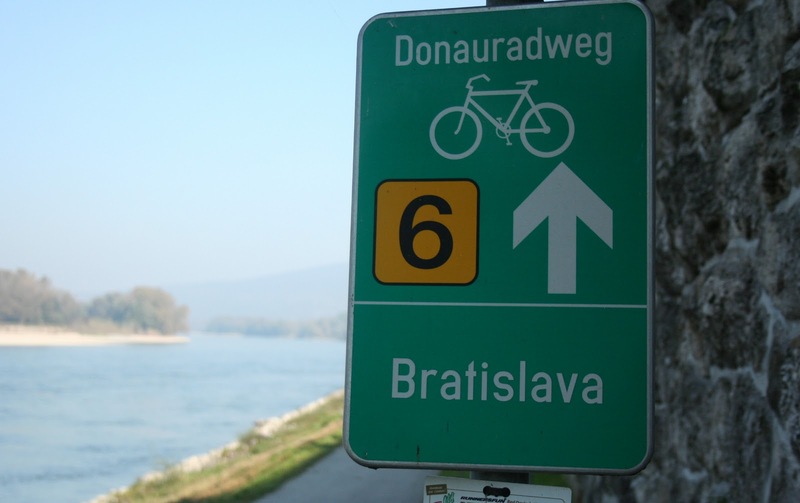 We left Vienna yesterday and crossed the border into Slovakia (and Eastern Europe) today. We're going to spend a day or two in Bratislava, which we've loved so far. We arrived this afternoon and spotted, amongst the throngs of the old town, a suspicious number of green jerseys. Unbeknownst to us, there seems to be a soccer match on here tomorrow night between Ireland and Slovakia, which we knew nothing about.... we wouldn't have known anymore about it had we been at home. The Irish flag on the bikes stood out a mile and drew them in, so we were forced to spend some time explaining to teetering Irish soccer fans that yes, we had really cycled here and no, we hadn't done so simply to watch a match. Thankfully, it seems that they're all leaving Bratislava in the morning to head to the match in the north of Slovakia, so we might have some peace and quiet. It's a beautiful city and has a very different feel to the towns and cities of neighbouring Austria. Dare I say it's more vibrant? But more on Bratislava anon, once we have a chance to explore it without the hordes.